Winter Box | Broward Lacrosse Advantage, Inc.
of their offensive skills would be exposure to box lacrosse"
4x4 goals. Regular goalie field gear. Contact to set up your team. No body checking. This is a finesse league. No long poles. Zero tolerance for fighting. Indoor lacrosse is rapidly taking hold as a great off season training regimen for the field game. Indoor lacrosse played on roller hockey rinks, ice skating rinks, and indoor soccer areas forces tight passes, stick protection, and fast paced play. It is the perfect training opportunity for lacrosse players to pursue in the off season leading up to the spring season. 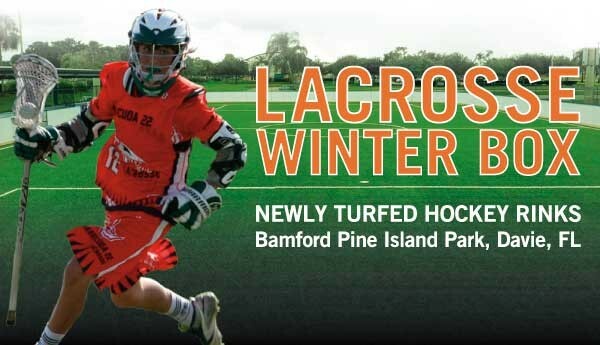 The turfed Rinks at Bamford Pine Island Park in Davie are the great new facilities that are ideal training facility for our sport, not to mention plenty of fun. Broward Lacrosse Advantage has secured the facility for six weeks of “indoor” lacrosse play this winter. Games are expected to be 2 evenings at 6 or 7pm starting around December 12 through January 11. Typically 2 games per week. Schedule will be set once teams are confirmed. There will be 8 games per team. Players can create and register as a team by naming the team, emailing the roster to pete@browardlaxadvantage.com, and having each player indicate the team name on the registration. Players can also register as individuals and be assigned to a team. Everyone knows that when space is reduced it speeds up the game and produces an environment where quicker decisions have to be made; ball handling skills and accuracy are therefore amplified. Indoor players get used to catching passes routinely that would seem difficult to impossible for in a typical field game. Smaller fields make all the action happen in tighter spaces. Shooting accuracy and finishing ability are clearly a developmental advantage when learning how to finish in small areas. But this isn’t the most important piece. By far, the most important concept taught in the sport of box lacrosse, which is a byproduct of small space, is always striving to take high percentage shots. In indoor lacrosse there are no poles. This provides a significant advantage for the development of the offensive players because they can work on their moves and ball handling against a defense that doesn’t beat them up and take the ball away. Too many times attackmen are either over powered by poles or are discouraged by their coach from dodging because of a bad match up. One of the staples of indoor lacrosse is the pick and roll both on and off the ball. It is the repetition of the pick and roll executed on the natural side of the players that teaches an extremely high level of reading the defense. Because he ball is never out of play. Indoor lacrosse players get more repetitions in practice.